Today the beta-1.5 update is available bringing new story unlocks and function effects. This update also has further improvements to beta-1.4’s autocomplete feature. As players progress through Robo Instructus they’ll unlock messages from the colony where the game is set. The initial focus was on the vital messages that provide useful puzzle info. With the latest update more pure story messages are starting to appear to flesh out the narrative archaeology. For beta players that have already completed levels with new content they’ll see an exclamation mark that indicates the unlocked messages have changed in this level. The new game experience will never see these markers. Tom has finished the effects to most of the functions currently available in the beta. The finished effects are all about making the game feel high-quality and adding a more distinct look to each of the functions you’ll need to master to progress through the game. Let’s take a look! I didn’t have time last week to write about the autocomplete functionality that is now in the game. Probably for the best as it would have been a pretty impenetrable technical piece of string similarity. But suffice to say autocomplete is in the game and the feedback is good, players like autocomplete! 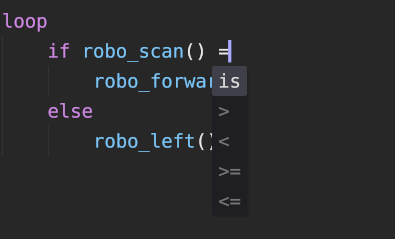 The latest update brings some smaller improvements with comparison operators and ‘==’ completion to help nudge you in the right direction for this common misuse of the language.